The Spring Festival activities hosted by the Organising Committee of the Private Engineering Office at Souq Waqif until January 4 have attracted a massive turnout of visitors from different nationalities, including Kuwaiti and Omani tourists. 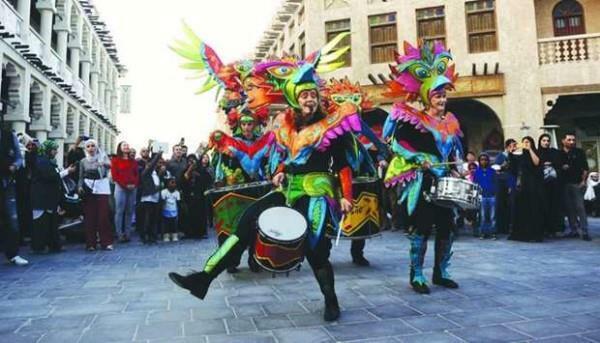 Local Arabic daily Arrayah reported Friday that the visitors are fascinated by the pleasant winter weather as well as captivating entertainment activities for all age groups, especially the folk performances by troupes from across the world and the various rides and games preferred by children. Further, Souq Waqif with its traditional ambiance and design appeals more to visitors from Kuwait and Oman and other countries as a live embodiment of the Gulf traditions and heritage, while offering the best services, great shopping outlets and eateries that appeal to all tastes. Mohamed Awad, a tourist from Oman, said that he had decided to spend his family holidays in Doha mainly due to the shared culture and tradition and the excellent relations between the two brotherly countries. He stressed that the atmosphere and the overall organisation of the festivities are superb even according to the best international standards. Qatar is a family-friendly destination that attracts people to have a wonderful time, he pointed out. Yousef al-Haddad, another Omani tourist, pointed out that the festivities in Doha blends masterfully the traditional with the modern. "While preserving the traditions the festivities give the youngsters great time to enjoy various rides and games," he said while adding that Doha has become his family's preferred destination to spend the holidays and every time he comes there are new things to enjoy. A Kuwaiti tourist said that young people love the festivities to a great extent and felt at home in Doha. "The events at Souq Waqif are excellent and Doha has great potential for attracting tourists from around the world," he added.